In Brazil, Mr. Dahmer was the Principal Double Bass of the PUCRS Philharmonic Orchestra, Section Bass of the University of Caxias do Sul Symphony Orchestra, and Section Bass at the Porto Alegre Symphony Orchestra (OSPA), orchestras where he developed a vast acquaintance with orchestral repertoire. He also performed as guest musician with many other orchestras such as the Lutheran University Chamber Orchestra, the São Pedro Chamber Orchestra, and the Unisinos Symphony Orchestra. In United States, Mr. Dahmer is the Principal Bass of the Meridian Symphony Orchestra, and Section Bass at the Tuscaloosa Symphony Orchestra and Gulf Coast Symphony Orchestra. He has also performed as guest musician with orchestras such as Pensacola Symphony Orchestra, Mississippi Symphony Orchestra, Mobile Symphony Orchestra, and Festival South Symphony Orchestra. 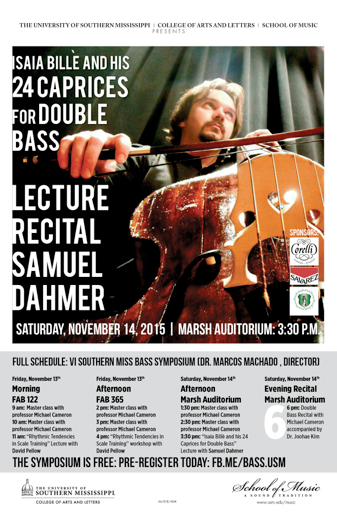 Currently, Samuel Dahmer is the Adjunct String Bass Professor at William Carey University, Bass Coach at the Hattiesburg Public School District Strings Program, and has recently taught a semester as Adjunct Double Bass Professor at The University of Southern Mississippi. In 2015, he also became the Double Bass Coach at the Festival South Orchestral and Chamber Music Academy. Along with his orchestral and teaching duties, Mr. Dahmer is conducting research for his dissertation, which is investigating the life and works of the Italian double bass pedagogue and virtuosi Isaia Billè.